Summer CSA members will receive weekly distributions of fresh, organic produce for 18 weeks from the last week of May through the end of September for $630. The quantity and variety will vary with the time of year and the weather. A “share” feeds 2 people generously or a family of 4 with small children. Weekly newsletters, which list produce, recipes, and other farm information, will be available too. We also offer u-pick opportunities for berries, flowers, tomatoes, cucumbers, basil, beans, and other produce which members may want to buy in bulk and/or preserve. Many opportunities for community building exist with various farm events, kid days, cooking classes, and volunteer days. Early registration is encouraged for purchasing seeds, farm supplies, and repairing equipment, but final payments are due on May 1, which also helps us formulate our farm plan and financial commitment to our upcoming farm crew. We also offer PRORATED SHARES if you sign up after May 27 throughout the rest of the season, which will be shown with weekly updated rates on the registration page. You should plan on picking up your first, prorated box the week AFTER you sign up along with a full payment for your share. Non-members and returning members are welcome! Please let us know if there are any questions. “SUMMER CSA SHARE” registration is now OPEN for 2019. SUMMER CSA SHARE: You will receive your produce each week in a 1/2 bushel box that will have been stored in a cooler as soon as it is packed in the mornings on Packing Days (Tuesdays and Fridays). As the season progresses there will also be some “Share Add-Ons”. These items will be on the side, because they don’t fit in the box, were harvested after the box was put together, or don’t need refrigeration. You will be measuring or loading these items into bags yourself, so you can choose to take the maximum or less, if your family can’t use so much. There will be about 8-10 items in your share during the first few weeks depending on what is seasonally available. You’ll continue to receive more items as the season progresses, ranging from 8 to 16 items. Each week our goal is to provide 1 to 4 salad greens (lettuce, arugula, etc. ), 1 to 4 cooking greens (collards, Swiss chard, kale, etc. ), 1 to 4 root vegetables (carrots, potatoes, etc. ), 1 to 4 fruiting vegetables (tomatoes, corn, squash, etc. ), 1 or 2 alliums (onions, garlic, etc. ), 1 to 3 brassicas (broccoli/cabbage family), and 1 or 2 herbs (basil, parsley, etc.). Keep in mind, that being part of a CSA means sharing in the risks and bounties of farming. If we suffer crop failure due to weather or insects, then there may be less of some items. If it’s a bumper year, then there may be more. Also, we don’t intentionally put worms or insects in your produce. Sometimes though these evasive creatures may slip by our volunteer’s or intern’s discerning eye. Please don´t throw the produce away! There are many good parts to an ear of corn, even if you have to break off the tip to remove a corn earworm. You may need to soak something like broccoli in salt water to encourage the caterpillars to float to the top, and remove them. Cut off offensive parts, if needed, and keep in mind this produce is still edible, tasty, and nutritious even if it is not aesthetically appealing. You will pick up your share once a week for 18 weeks on your chosen pick up day during the hours that are listed below. Basically there are two Distribution Harvests during the week. For the first distribution we harvest produce on Mondays and Tuesdays for the Wednesday Distribution. Then we harvest for the second distribution on Thursdays and Fridays for the Friday/Saturday Distribution. Our Packing Days (when we pack up your share box) are on Tuesdays and Fridays. 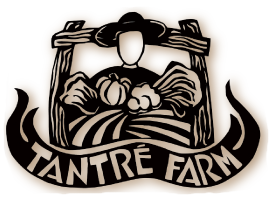 At the Chelsea Farmers Market (www.chelseafarmersmkt.org) just look for the Tantré Farm sign. Introduce yourself to us at the market stall, and you will be helped. Please remember to check off your name on the Pick up List, and take a newsletter from clipboard, if needed. Advantages for pick up at Chelsea Farmers Market: You can buy extra items from our stall and other vendors’ stalls along with enjoying local live musicians, food demos, vendor basket giveaways, and other market events. DISTRIBUTION at Chelsea: Sat. 8 AM until Noon. MOVE (www.movewellness.com) is an energetic studio to help clients live a happy, healthy life through positive fitness and wellness experiences. Tantre shares will be outside the building near the front door on the north side of building. This will be a “self-serve” pickup spot, so please check off your name on the clipboard, follow the instructions on the white board or Pick Up List, and take a newsletter if needed. MOVE staff can answer limited questions. There is no refrigeration, so please pick shares up promptly to enjoy your produce at its freshest! MOVE is not responsible for shares left unclaimed, so shares left there after noon will be donated or brought back to the farm, unless prior arrangements have been made. Advantages for pick up at MOVE: You have opportunities for classes at MOVE with pilates, yoga, massage, wellness coaching, etc. Other stores are nearby to shop or have a cup of coffee. DISTRIBUTION at MOVE Fitness and Wellness Studio: Wed. 8 AM until Noon. Pure Pastures (www.purepasturesmi.com) is a specialty grocery store in Plymouth that offers grass-fed meat, eggs, dairy products, and organic, gluten-free, nonGMO products. Shares will be outside on the north side of the building. This will be a “self-serve” pickup spot, so please check off your name on the clipboard, follow the instructions on the white board, and take a paper newsletter if needed. Pure Pastures staff can answer limited questions. Shares will not be refrigerated, so please pick up shares promptly (especially on hot days!) to enjoy your produce at its freshest. Pure Pastures is not responsible for shares left unclaimed, unless prior arrangements have been made.